Rare book and print collector Lessing Julius Rosenwald (1891-1979) donated part of his collection to the Library of Congress and the other part to the National Gallery of Art. Recently, these two organizations joined together to catalogue the Rosenwald collections into a mutual database so that researchers can search, retrieve, and use the materials together even though they are physically stored separately (tba). Rosenwald was also one of the founding members of the Print Council of America, established in 1956 by a small group of museum curators, scholars, and collectors with a mission to “foster the creation, dissemination, and appreciation of fine prints, old and new.” At our annual meeting held last week in Los Angeles, Ruth Fine, emeritus curator of special projects in modern art at the NGA, generously offered members the gift of a Rosenwald bookplate. Thank you Ruth! 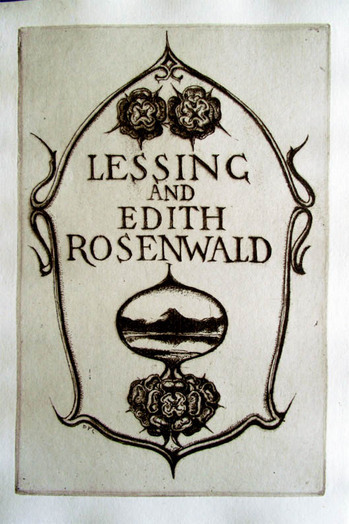 Note the iconography of his ex libris: images of roses and of a forest (“wald”) = rose and wald = Rosenwald.